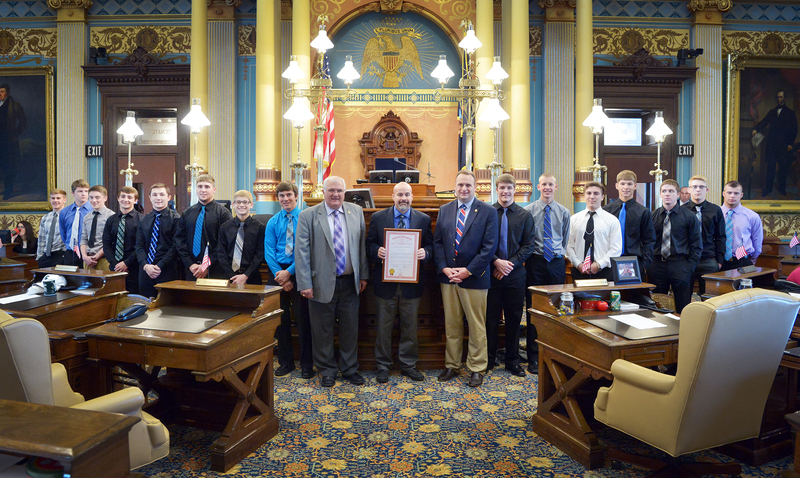 LANSING, Mich. — Sen. Dale Zorn on Wednesday honored the Dundee High School varsity wrestling team at the Michigan Capitol for their undefeated season and Division 3 state championship. “The Dundee Vikings wrestling team’s dedication to teamwork earned this talented group of young men the admiration and respect of their families, friends and fellow students,” said Zorn, R-Ida. “After a loss in the state finals last year, this team responded with a 21-match win streak to go undefeated — gaining a LCAA conference championship and the 2016 state championship. It was a season that will be recorded in history and long remembered by these young men and their community. Zorn said that only 17 athletes showed up on the first day of practice. The team suffered several injuries throughout the season. 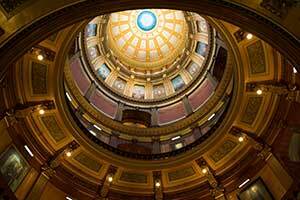 Some injuries were minor, some put an end to the season and some ended wrestling careers. Zorn presented Coach Tim Roberts and the team with a special tribute recognizing the team and their accomplishment.